O Mahaveer, your actions are mighty and terrible, and your body is strong as a thunderbolt. You eliminate the illusions of the mind and give a bright intellect. Here the Hanuman Chalisa lists further qualities that Hanuman possessed, which we can learn from in order to achieve our potentials. Verse 5 begins with praise of Hanuman’s bravery. Mahaveer (or Mahabir) means “great brave one”. We have already discussed Hanuman’s immeasurable strength, but strength without bravery is of little use. Hanuman was both strong and brave, as is demonstrated in numerous occasions in the Ramayana. The significance of some of these forms of bravery may not be immediately obvious. But when one analyses what is asked in each of these circumstances, it can be appreciated that a lot of courage is required in each case. To make one example, particularly relevant in modern society is the difficulty that may arise to stay steady in one’s ethics or principles when to do so will lead to temporary financial loss or social isolation. A person may be tempted to sacrifice one’s ethics or principles in such circumstances. It takes bravery to be Dharmaveer (i.e. to stick to one’s principles) in such a case. How does one develop such bravery? Unflinching faith in God and also faith in oneself automatically creates this bravery. A genuine belief in a beneficent higher power and confidence that one’s own actions are of sincere service to this higher power creates confidence to stay steadfast even if you may come to harm or hardship. This was the faith which Hanuman possessed. Bikram means “whose actions have been mighty.” Great actions flowed naturally from Hanuman, meaning that not only did he cultivate great qualities but he translated these into actions which were in service to Lord Rama, and to the world. Bajrangi means “one whose body is as strong as a thunderbolt”. The thunderbolt is the weapon of Lord Indra, King of the Devas (Gods, beneficent forces). It is a weapon made by Lord Brahma, infallible and born of extreme penance, used for the protection of the Devas in their battles against the Asuras (Demons, negative forces). It is a mighty weapon, and one that is used only as a last resort, to protect the world’s evolutionary progress. Hence the name Bajrangi emerges from Hanuman’s splendid physical prowess. Hanuman is the patron deity of all sports, especially physical training and wrestling. To make the body strong and fit makes one better able to serve Lord Rama. We personally may not be able to be like Hanuman, but Hanuman is an ideal who is paced before all Hindus who are trying to do service in a cause to which they are devoted. It should be noted that all devotees of Hanuman should develop their strength and vitality, regardless of what field you are involved in. It greatly increases discipline, effectiveness and even your influence amongst others. Hanuman is also the destroyer of evil in ways other than the physical destruction of foes of Lord Rama. He removed the web of illusion in the minds of all who he was in close contact with. He took people away from incorrect loyalties and temporary fleeting attachments, taking them instead towards the Supreme Being, which is the most important yet neglected relationship that any person should cultivate. For example, Vibhishana of Lanka was influenced by Hanuman to take Rama’s side in the conflict, because to be on the side of truth and righteousness, the side of Dharma, is more important than his sentimental wish not to be disloyal to his brother Ravana. Sugreeva also took Hanuman’s advice, before which he was cowering in fear, and Hanuman took Sugreeva towards Lord Rama’s service when he was thinking of wavering in his promise to help look for Sita. 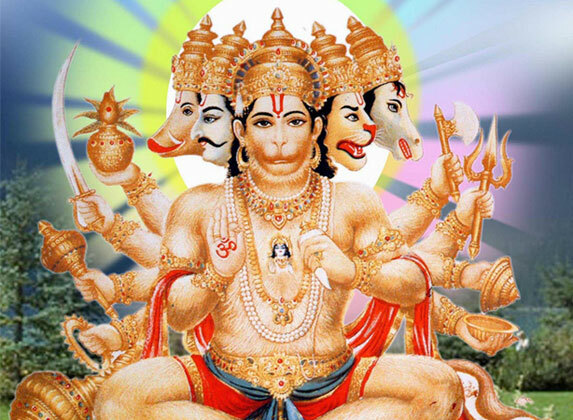 To contemplate Hanuman’s immeasurable qualities can have the same effect in our own lives – namely to eliminate mental illusions born of weakness, attachment and wrong desires, and give a bright intellect. This is the benefit of learning, studying and reciting the Hanuman Chalisa. This verse praises Hanuman’s beauty. There is something very endearing about Lord Hanuman’s appearance. It emanates love and peace. All children love “Hanuman Dada” (as kids call him). Despite being of the appearance of a monkey, people are drawn to his appearance. People always finds their own mother and grandmother beautiful, regardless if she is very aged. Beauty is not in the form but in the love that radiates from the form. This is why all Hindus find Hanuman very beautiful, because immense love and beneficence emanates from his image. He is described as having earrings and having curly hair. No doubt he wore earrings, as did most men in ancient Hindu times. There is another meaning also. In the Subhashitas, beautiful quotes in Sanskrit, on the subject of ethics, it is described what the true ornaments of one’s body are. Service to others is the true bangle decorating one’s hands and to listen to “Hari katha” (stories and discourses of God) are true earrings. Hanuman’s time was spent listening to stories of Lord Rama’s deeds. Today too many of us decorate our ears with horrible rocks – gossip, back chatting and looking at other’s faults, which poison our characters. We imbibe a lot of what we spend our time listening to and talking about. « Lord Rama’s exact year & date of birth now known? !